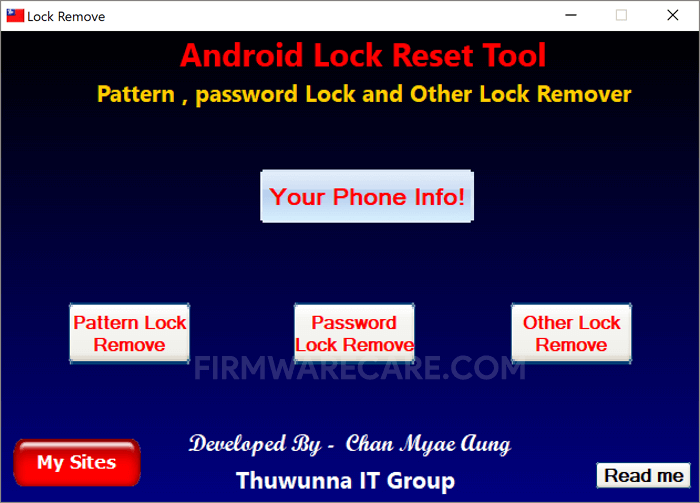 Android Lock Reset Tool is a small application for windows computer created by Thuwunna IT Group, which allows you to remove the pattern lock, password lock, pin lock from almost every Android device in the World. In order to use the tool, you need to install the ADB Driver on your Computer, then after connect your device to the computer with usb debugging mode enabled, and Click on the Your Phone Info button to verify that your Android device is connected with the Computer or not. Once tool detects the device, click on the Pattern Lock Remove button or Password Lock Remove Button or Other Lock Remove button as per your device Lock requirements. [*] Compatibility: The Android Lock Reset Tool runs perfectly on Windows XP, Windows Vista, Windows 7, Windows 8, Windows 8.1 and Windows 10 (32 bit and 64 bit). [*] Credits: Android Lock Reset Tool is created and distributed by Chan Myae Aung (developer). So, full credits goes to Chan Myae Aung (developer) for sharing the tool for free.